Ok, so it's not going to win any prizes for the cover and the author's name sounds like reindeer. Let's just get that out of the way. Look past them if you can because this is actually a fascinating book. It is written by a man whose daughter accused him of sexual abuse that she repressed as a child and only remembered as an adult. 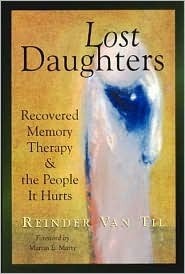 Because Mr. van Til knows he didn't abuse his daugther, he has devoted years of his life to meticulously researching recovered memory therapy, scientific studies of memory, and case studies of other families that have been destroyed by false memories recovered by their adult children. Incredibly impressive, especially given that van Tilen is not a scientist or doctor by profession. I do feel like that should be said up front, but please don't take that to mean that he doesn't know what he's talking about. It is obvious from his extensive research and impeccably cited sources that the man has done his homework. He presents the information in an accessible but professional manner and has done a truly excellent job at presenting numerous scientific studies as well as case studies to back up his claims. This is, primarily, an academic work. It does contain several stories narrated by families who have been devastated by the recovery of false memories, but the majority of the work focuses on the movements that lead to false memories (militant feminism and extremely fundamentalist Christian sects), the cultural influences on false memories (the Satanism craze of the early 90's, police interrogation styles, etc), and the scientific proof that memories can and have been implanted in children and adults. It covers a lot of material and, at times, reads like a psychology text or a research compilation. It's not light reading, but if you are interested in the topic or you are interested in psychology, it is fascinating. I highly recommend it for those who are interested in the subject and who aren't bored by academic and scientific research. I also recommend it for those who aren't easily upset by the topic of sexual abuse because, by the nature of its topic, the book does contain case studies where people are accused of various forms of sexual abuse.